KLF4 regulates Cx26 transcription levels by binding directly to the proximal promoter. (A) Levels of Cx26 mRNA are relative to Klf4 expression. At E16.5, when the epidermal permeability barrier was first established, Klf4–/– and K5-Klf4 transgenic mice express 3.0-fold higher and 1.6-fold lower levels of Cx26 mRNA than wild-type littermates, respectively. The upregulation of Cx26 persists in Klf4–/– mice at E18.5 and as newborns (NB). 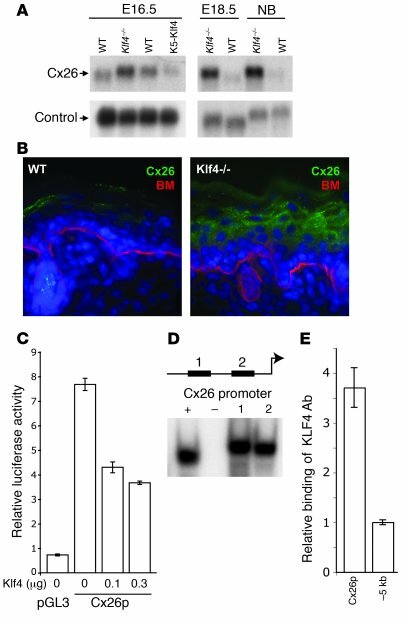 (B) CX26 protein is weakly expressed in the suprabasal layers of newborn wild-type skin and strongly expressed in Klf4–/– epidermis. Basement membrane (BM) is marked with α6 integrin staining. Magnification, ×40. (C) KLF4 protein represses minimal Cx26 promoter in a dose-dependent manner. Cx26 promoter (Cx26p) yields activation 8-fold greater than promoterless pGL3 vector. This activity is repressed in a dose-dependent fashion by cotransfection with Klf4. (D) KLF4 binds sequences in the proximal Cx26 promoter. Computational analysis predicted 2 KLF4 binding sites in the minimal Cx26 promoter. As shown by EMSA, both sites are bound by KLF4. +, positive control for KLF4 binding site; –, mutated KLF4 site. (E) KLF4 binds directly to the proximal Cx26 promoter. Quantitative real-time PCR performed on specific KLF4 chromatin immunocomplexes demonstrated that the Cx26 promoter region is enriched 3.7-fold relative to an amplicon 5 kb proximal to the Cx26 locus. Results for all samples are normalized to input DNA.